I am very impressed with the performance and build quality of the Inspiron B120, as I had very low expectations when I ordered it. Prior to having the B120, I belonged to the anti Dell crowd and only bought it because the price was so low. I was actually shocked when I first used it. The battery life could be better, but for the price I paid, I can't complain too much. With a RAM upgrade this should be a great student or work laptop that can master all Microsoft Office applications with ease and also perform certain multimedia tasks. I definitely recommend the B120 to anyone that can't or doesn't want to spend a lot of money on a portable computer. Budget notebooks have never been better! Low-end notebooks were always priced at $800 or more, and never really packed the "oomph" of higher-spec expensive notebooks. This may have changed. The Inspiron 1300 has set the benchmark for budget notebooks for a while yet, with it's solid performance and even better price. Although the speakers are rather dire and the lack of microphone is irritating, what do you really expect for an $800 notebook? Pros: Good performance, spacious hard disk, DVD±R/W drive, great screen, excellent WiFi signal, solid construction, quality keyboard. Cons: lack of microphone, speakers aren't great, almost no ExpressCard peripherals available. 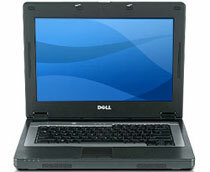 The Dell 1300 ends up being a fine notebook for general usage and as an extension of a desktop computer. Obviously this notebook is not for gaming, but if you're looking for a cheap solution for a portable PC so you can do work or surf the web from the couch, or have a cheap PC in the dorm room then the 1300 is fine. To be honest, I think the HP dv4000, HP dv1000 and equivalent Compaq offerings (Presario v2000 and Presario v4000t) are price equivalent notebooks with much better features. I can't whole heartedly endorse buying this notebook when there's better options out there for the same price, but if you like Dell and can use one of the often available Dell coupons to get a good price on this machine then it's not a bad pick. 79% Den Mobilen für daheim?